Video clip synopsis – In the 1930s, a New Zealand-born horse called Phar Lap won the hearts of Australians and became one of our most loved and enduring icons. Broadband MP4 pharlaps_bb.mp4 (17.4MB), suitable for iPods and computer downloads. 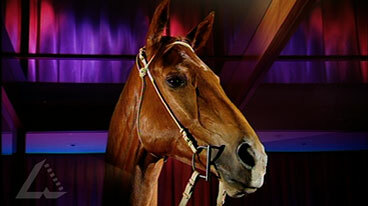 Phar Lap’s Hide is an episode of the series National Treasures produced in 2004. How did a New Zealand-born horse become one of Australia’s most loved and enduring icons? Warren Brown visits Melbourne Museum where the legendary Phar Lap – or at least his preserved hide – stands in a glass case. Curator Elizabeth Willis explains why this big red horse won our hearts and the circumstances around his mysterious death. Take a road-trip of discovery with the irrepressible Warren Brown – political cartoonist, columnist and history “tragic” – as he reveals a fascinating mix of national treasures drawn from public and private collections across Australia. On its own, each treasure is a priceless snapshot of an historic moment. Together, they illustrate the vitality and uniqueness of the Australian experience. National Treasures is a Film Australia National Interest Program. Produced with the assistance of the Australian Broadcasting Corporation. Phar Lap was one of the greatest ever race horses. Bred in New Zealand, he did all his racing in Australia, except for one race in the United States. The name Phar Lap comes from a Zhuang (southern Chinese) and Thai word meaning ‘lightning’. Phar Lap was initially a failure as a racehorse, losing his first four races. However, in his four year career, Phar Lap won 37 of the 51 races in which he was entered, including the 1930 Melbourne Cup. He won 32 of his last 35 races. In the three races which he did not win, he ran 2nd on two occasions, beaten by a short head and a neck, and in the 1931 Melbourne Cup he finished 8th when carrying 10 stone 10 pounds (68 kilograms). In 1932 Phar Lap was taken to the United States, where prize money was far greater than in Australia. He won his only start, in the Agua Caliente handicap in California, and then became ill. The horse’s trainer found him in severe pain, carrying a high temperature. Within a few hours, Phar Lap haemorrhaged to death. Much speculation ensued, and when an autopsy revealed that the horse’s stomach and intestines were inflamed, many believed the horse had been deliberately poisoned. There have been several theories offered over the years to explain his death, including accidental poisoning from lead insecticide and a stomach condition. In the most recent theory in 2000, equine specialists studying the two autopsies concluded that Phar Lap probably died of duedentis-proximal jejunitis, an acute bacterial gastroenteritis. It was not until the 1980s that the infection had been formally identified. When news of Phar Lap’s death reached Australia thousands grieved. Phar Lap’s remains are today found in three significant cultural institutions. A New York City taxidermist prepared his hide, which was sent to the Melbourne Museum for display. Phar Lap’s heart was remarkable for its size, weighing some 6.2 kilograms, compared with a normal horse’s heart at 3.2 kilograms. His heart was donated to the Institute of Anatomy in Canberra and his skeleton to the Te Papa New Zealand National Museum in Wellington. Phar Lap has been included as one of the five inaugural horse inductees into the Australian Racing Hall of Fame, alongside the other turf immortals Carbine, Tulloch, Bernborough and Kingston Town. When did Phar Lap race? Phar Lap raced during the Depression — what was the Depression? Why would Phar Lap have had special appeal during the Depression? What happened to Phar Lap? What evidence is there that people loved him? Phar Lap’s career was during the Depression of the early 1930s. How might this have influenced his image and reputation? Suggest hypotheses to explain Phar Lap’s popularity. How could you test these hypotheses? How did people react at the time? Why was this death so significant to them? What are the results of those changes in performance, popularity and prize money?